The expansion of the San Diego Convention Center has been front and center across the region, with everybody from sports fans to politicians expressing their views on the project. With years of legwork done on the expansion’s behalf, the planned contiguous expansion promises to be a waterfront asset with public space as its focal point. When complete, the expanded San Diego Convention Center will create $700 million in economic impact and $13 million in additional hotel tax revenue. Of course, keeping the Chargers in San Diego is a priority, but this is not seen as an either-or situation. San Diego can have a world-class convention center and a world-class football stadium. It would be a service to our economy and community to have both. The majority of San Diegans have worked hard to get to a place where we’re on the same page about the fate of the contiguous expansion. We need to move forward now. We need to show potential conference visitors and the rest of the world what we already know: San Diego is a great place to live and work. For starters, we can take a look at the medical conventions hosted at the San Diego Convention Center. With six medical conventions slated for Fall 2013, the industry brings a reported $293.3 million in economic impact. Hands down, Comic-Con has the largest economic impact of any conference in San Diego. As Convention Center expansion proponents note, it is essential not only for economic impact, but also for maintaining the region’s cultural foothold. However, the Society for Neuroscience will bring 32,000 attendees and generate more than $131.9 million in economic impact. 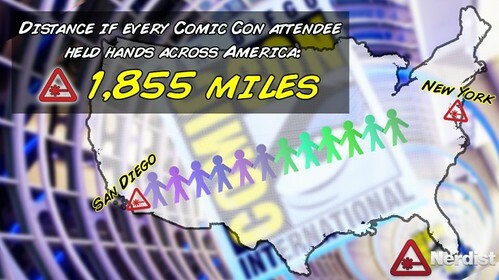 That’s nearly 75 percent of Comic-Con’s impact, with only a quarter of the number of attendees. Compounded with the region’s strong life sciences research – thanks to Sanford Burnham and others - and strong healthcare facilities, it would be hard to argue that these are not the exact type of people we want to attract to the region. Conferences are one way to get them here and we cannot delay the process any longer. Every year, there is a plethora of conferences that San Diego cannot host simply because we do not have the capacity. Our convention center business is already booming, but as conference organizers continuously expand, we cannot rest on our laurels any longer that our nice weather will bring people here. Yes, it helps but we need the capacity. The airport’s new Green Build just added 10 additional gates and numerous commercial opportunities. The expanded San Diego Central Library is slated to open next week. Now the convention center needs to follow suit. Build it and they – the talent, the conferences, the investors -will come. As an inveterate reader of the New York Times (online 24/6 and thick, wonderful print copy on Sunday) I was thrilled when I saw the Travel section was going to highlight San Diego in one of their “36 Hours in …” profiles. Imagine my dismay when from the very first sentence I felt like the writer was describing a bad cartoon, poorly illustrated and lacking a solid punch line. Why should this matter to an economic development professional? Because not only is San Diego's convention and visitor industry the third largest industry in San Diego, it is also one of the ways we attract talent. As one of the top 10 visitor and meeting destinations in the U.S., with more than 30 million visitors a year, it is no surprise that many of San Diego's knowledge workers first visited the region as a tourist or convention delegate. So you can imagine that sentences that start with “If San Diego has an identity at all…” and a comparison to the movie Pleasantville (where two teens are sucked into their television into a black and white 1950's world which they slowly transform into color) would set a local’s teeth on edge. I’d love to hear from the biotech entrepreneurs and the wireless communications wizards if that’s how they saw San Diego when They Came Here. And by the way, Torrey Pines State Natural Reserve, which is mentioned in the article, is across the street from some of the most advanced medical research facilities in the world. Believe me, the researchers love running the beach and the trails at lunch – year round. Set aside for the moment whether the characterization is true or not (it’s not) and think about whether this kind of description would make you want to visit any location. Even Sioux Falls, South Dakota would want to be described in a more flattering way. San Diego’s tech community has a reputation as open and welcoming and that’s one reason we’re successful at attracting the best and the brightest to work in our diverse technology clusters that range from defense to sports innovation, life sciences and clean tech. It was a day of firsts at San Diego International Airport (SDIA) on Sunday, December 2, as Japan Airlines (JAL) flight #66 arrived from Tokyo and flight #65 departed. It was also the first commercial flight out of SDIA for the highly touted Boeing 787 Dreamliner. "Let's think of all the real people who will benefit from this flight," said Thella Bowens, President and CEO of the San Diego County Regional Airport Authority, adding that half a million people from San Diego travel to Asia every year. Bowens described the Dreamliner as a dream aircraft for the San Diego market because it is the first aircraft with the size, airfield performance and range to make the nonstop oceanic flight viable. San Diego Regional EDC worked with the Airport Authority and other organizations to make the case for the San Diego-Tokyo flight. Before now, business executives had to fly to Los Angeles, San Francisco or other west coast cities to connect to Asia. The new Tokyo service will link directly to 15 other destinations in Asia. Bob Filner, new Mayor of the City of San Diego, attended the press conference held prior to the arrival of the inbound flight and reiterated his desire to strengthen San Diego's image as an international center. "I want to make San Diego a far more cosmopolitan center," said Filner. He also recognized the economic benefits the new flight will bring to the San Diego region. The ceremonies that accompanied the launch of the new service were marked by elegant protocol and buoyant enthusiasm. White gloved dignitaries simultaneously cut a ribbon with multiple pairs of large gold scissors. JAL President Yoshiharu Ueki, invoking the Spirit of St. Louis (which was built in San Diego), said "San Diego is so connected to aviation history. Time has brought us more innovation in the new Boeing 787 Dreamliner and it has special meaning to me to take this historic journey with you." The flight will operate four times weekly (Monday, Wednesday, Friday, Sunday) until March 2, 2013, when it becomes a daily flight. The current configuration for the San Diego flight consists of 42 business-class seats and 144 economy seats.